My Pandora continues to play different Artists, but all in the same genre. How can I set this up so that I get to hear alternating albums? When you are referring to hearing alternating albums, are you referring to albums of the same artist (as in the channel you're listening to), or off all the different artists that it plays on that channel? Please help me understand this a little more. I want to hear albums of different artists. I don't know what you mean by "plays on that channel." I understand what you mean now. I meant to say station instead of channel. I was referring to the station on pandora that you're listening to. If you type in an artist, it will create a new channel/station with a mix of artists. In regards ***** ***** your question, this cannot be done on Pandora since Pandora's playlists are randomized (with the exception of choosing thumbs up or thumbs down for each song). However, if you use the program Spotify, you can find all the albums of these artists and listen to them for free. I posted the link below. Many users will use a combination of Pandora and Spotify to listen to the free music of different artists. With Spotify, you can also place the songs you like from different albums into your own playlists so you can listen to them whenever you want. This should take care of the problem/concern you have. Please let me know if this doesn't make sense or if there's anything else I can help you with regarding this topic and I'll be happy to help. If you do not need further assistance from me, please take a moment to rate my service as well. 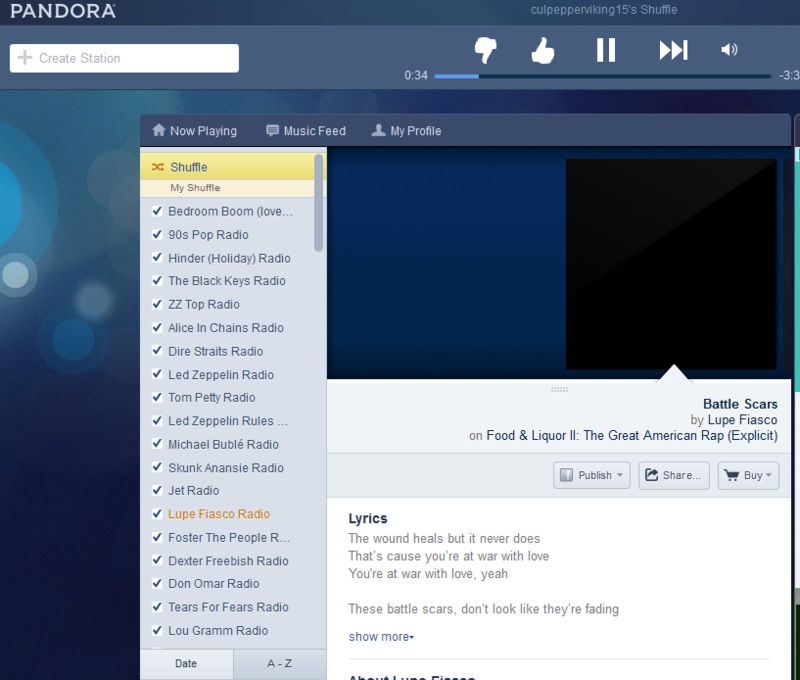 I need Pandora to "randomize" into different artists/albums/stations after each song. In that case, you can select the different stations you like and turn just those stations to SHUFFLE. This will let you choose several of your stations and just randomize within those stations. To do this, click on Shuffle at the top of your station list to enter this mode. You can click on the arrow under Shuffle to select Shuffle All (which includes all of your stations), My Shuffle (which you can customize), or select stations from a particular Genre. If you select My Shuffle, then you can choose which stations to include by checking the box next to that station name. To turn off your Shuffle, simply select a station to listen to from your station list. I'm sorry to be such an idiot. How, or where, do I get to my station list? Not a problem Paul. I'm only here to help. Here's a screenshot I was able to find online that shows that station list. If you see on the left, there's several check marks. If you click SHUFFLE at the top of the list, you can then choose the stations you want to add to the shuffle mix. This will keep all the music within those stations (although the artists will still vary within those stations). Hopefully this make sense. If not, please feel free to ask any questions. I'll do my best to keep everything as least complicated as possible. Can I get to this on my desk-top, with my cell phone "plugged-in" to it? I don't think you can do it via cell phone. You would need a desktop/laptop computer or a tablet. If you go to www.pandora.com , you should be able to login to your account from there and do what I had explained above. Please let me know if that helped. Also, please remember to rate my service whenever you are finished with my support. I am still very confused and have a friend who said he will help me. Please tell me how I can cancel your service. I had pandora one on my iphone5. I recently purchased iphone6.